Home » Forums » Discussions » Immune Attack: Primary or Secondary? Peter Stys acknowledges that overwhelming evidence supports the traditional view of multiple sclerosis (MS) as an autoimmune inflammatory disorder, where T cells wrongly attack the myelin sheathing of neurons and damage the underlying axons. But what if MS first arises from an underlying primary degenerative disorder in the central nervous system (CNS), and is then made worse by a secondary immune attack in the brain, spinal cord, and eye? If so, by concentrating on the inflammatory aspects, MS researchers may be neglecting an equally crucial disease component and missing out on potentially better treatments, suggests Peter Stys, a neurologist at University of Calgary, Canada. He and his co-authors recently made their case in an eight-page article in the July 2012 Nature Reviews Neuroscience (Stys et al., 2012). 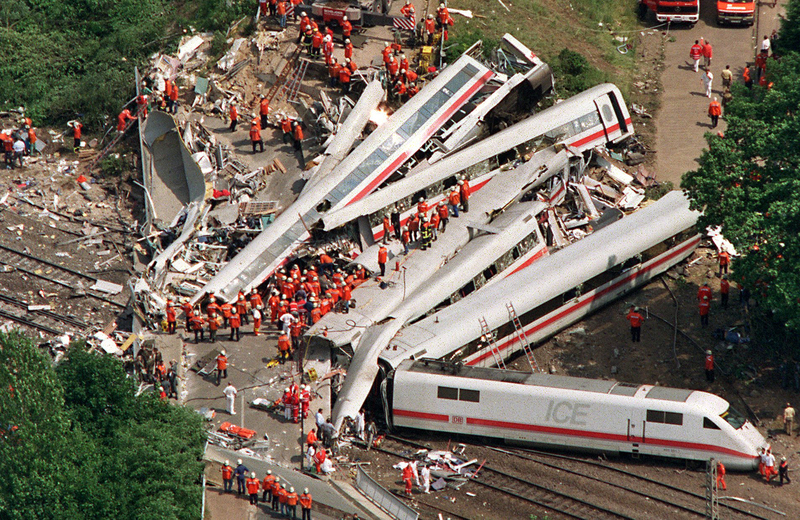 In talks, Stys projects a persuasive image of a train wreck to make his point by analogy. MSDF invited Stys to kick off a discussion on the question, evidence, implications, and limitations of thinking about MS as a neurodegenerative disease at its root. Do you agree with Stys that neurodegeneration might be the primary cause of MS? How might thinking about MS as a neurodegenerative disorder advance research and therapeutic strategies? What else can the autoimmune inflammatory disease model contribute? What experiments would you propose—even completely impossible ones—to elucidate the roles of inflammation and neurodegeneration in MS. When I give my talks, I give an extreme view to drive the point home. In reality, the disease has two key ingredients: a destructive immune reaction and neurodegeneration. We've known for a century about the inflammatory attack on myelin. We know far less about the neurodegeneration. The train wreck image is analogous to a human pathology slide—and as valuable as the analogy is, it should be interpreted with caution. Step back and pretend you are an investigator from another planet who beamed into the crash site. You see the guys in red have infiltrated the site, like T cells penetrate into the brain. If you look closely, you see some of them with welding torches. It's reasonable to interpret that these guys are running around trying to wreck what remains. Maybe they even got together before the train arrived and sabotaged the tracks. Then you talk to someone who was there before it happened. Your witness noticed a loose rail and saw the train leave the tracks. You think, wow, that is so different from how I was thinking. When you press, the witness reveals that there weren't any guys in red when the train left the tracks. You can say the witness got it all wrong, or maybe the witness was lucky to be in the right place at the right time. I have no evidence to support MS as a primarily neurodegenerative disease, but the MS literature is peppered with insights and inconsistencies that could support either thesis. In an example that jumps out, widely prescribed immune modulators that are highly effective in reducing and sometimes completely eliminating relapses and neuroinflammation are largely ineffective in later progressive phases of the disease and in patients with primary progressive MS (PPMS). In the Alzheimer's disease (AD) field, people have been hammering away at the neurodegenerative mechanisms and learned a ton, but have not cracked the nut. MS is where AD was 50 years ago. I'm concerned that we have let a lot of time go by without thinking of inflammation and neurodegeneration along parallel research tracks. The sooner we start, the better off patients may be. I would go further that there is no direct evidence that T cells are targeting intact myelin. I look primarily to the long-standing studies of Prineas and his colleagues showing oligodendrocyte apoptosis and myelin unravelling in the absence of T cell infiltration. In these studies it appears that macrophages, which are of course part of the innate immune system, are engulfing myelin debris. The antibodies to myelin in the systemic circulation and spinal fluid and the myelin-reactive T cells in the lymph nodes appear to be a result of presentation of myelin fragments, not a cause of myelin damage. In addition T and B cells cannot cross a healthy blood-brain barrier, they enter after damage has already occurred in the brain parenchyma. These findings are better explained as a response to oligodendrocyte and myelin damage and not a cause of it. If the immune attack on myelin is primary, how does one account for breakdown in the blood-retinal barrier (often associated with venous sheathing) seen in many people with MS (e.g., Birch et al. 1996. Archives of Ophthalmology 114: 34-39. There is no myelin in the retina. Retinal involvement in MS and the fact that immunomodulatory drugs longest in use have no effect on longterm progression of MS should cause serious consideration of the hypothesis that the immune involvement in MS is a secondary and not primary phenomenon.